Last Flag Flying is a poignant yet comedic road trip movie that honors the sacrosanct fraternity of brothers-in-arms while castigating a wartime culture that sacrifices so many in the name of Honor. In this somber yet fittingly irreverent film, with an exceptional ensemble cast starring Steve Carell, Bryan Cranston and Laurence Fishburne, the story begins in 2003 when former Navy Corps medic Richard “Doc” Shepherd (Carell) shows up one rainy night in the seedy bar of his old marine buddy, Sal (Cranston). The two haven’t seen each other in over 30 years, since serving together in Viet Nam. The reason Doc has shown up out of the blue is to ask Sal if he would accompany him on one last mission: to retrieve the remains of Doc’s son, Larry who has just been killed in action in Iraq. But first they have to pick up the (now) Rev. Richard Mueller (played by Laurence Fishburne, whose character was anything but pious during the war) and together, the three men embark on an odyssey that forces them to come to terms with the remnants of a war that’s still haunting them to this day. A confrontation with the Army brass and their rigid set of burial protocols jettisons the old friends further afield from the norm as they make their way to Doc’s hometown in New Hampshire, where he wants his son’s final resting place to be. But before they reach their final destination, they have to make one more stop to visit the mother of a fallen soldier with whom they served (in a small but electrifying performance by the great Cicely Tyson), presumably to set the record straight about her boy. If you’re not paying attention, you might miss the fact that the entire moral heartbeat of the film is beating – simply and steadily – in this short but galvanizing scene. 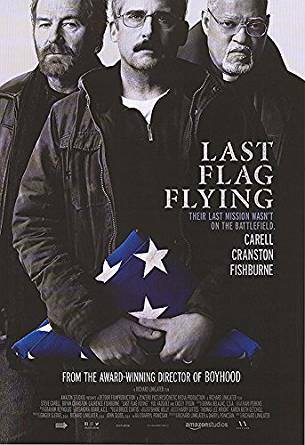 What some may not know about Last Flag Flying is that it’s based on the novel by former member of the US Navy, Daryl Ponicsan (who also co-wrote the screenplay with director, Richard Linklater). The novel was in fact a sequel to the anti-war book, The Last Detail, which was later made into a movie in 1973. Linklater (best known for his recent groundbreaking film, Boyhood) has stated, though, that the two films are not companion pieces and that Last Flag Flying is meant to be seen as a stand-alone. This is the kind of movie that should be seen with others, as it’s clearly meant to stimulate discussion and debate about the necessity of war, the fraternity of service, the myth of heroism and sacrifice, and the core values that we rely on to justify it all. Last Flag Flying is presently streaming on Amazon Prime.